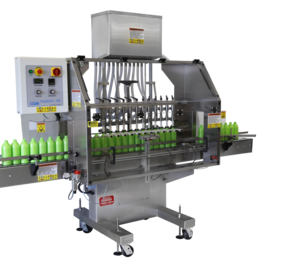 -Fully Automatic, Microprocessor controlled, straight line liquid filling machine. Handles glass, plastic or metal containers. Handles all free flowing liquids (excellent with foaming thin products). The Model FA-G Gravity Filler comes equipped with the following standard features at no charge. Bottle range of 1 3/4” high to one-gallon glass, plastic and metal containers. For all free flowing liquids. All product contact parts to be stainless steel or plastic. Standard one piece welded construction cabinet. Stainless steel 20 gallon supply tank and 20 gallon gravity upper tank. Standard stainless steel upper supply tank float level sensor for pneumatic pump. Totally adjustable pneumatic stainless steel cylinder bottle gating system. Four (4) heavy duty casters for portability. No bottle-no fill-safety switch standard. Only one main moving part. No changeover parts for all similar neck finish containers. Requires minimal conveyor space (44”; 59” with control panel). Head rack, vertical columns, height adjustment screw, etc., to be stainless steel standard. Microprocessor controlled for ease of use. All liquid filling applications. Excellent with thin foaming products.